1, Servo double cutter Commutator Turning Machine is used for commutator turning. The Commutator Turning Machine is equipped with double cutters, commutator deburring equipment and dust collection. 2, The cutter moves in axial or radial direction. It is driven by three spindle servo motor. 3, Three spindle servo motor controlling ensures the stable and precise cutter feeding. 4, PLC and touch screen control. 5, Cutter feeding and cutting is controlled by servo motor. 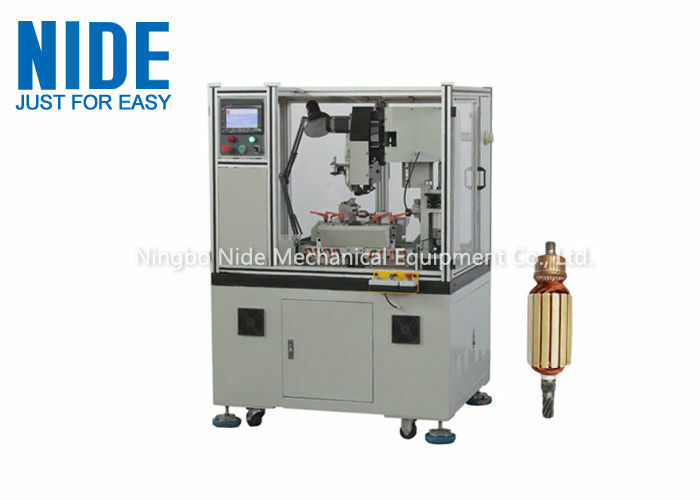 ND-LHL-QSFA Servo double cutters commutator turning machine is suitable for turning commutator. With advanced design, good shape and high performance, this machine adopts servo control for cutter moving and turning. Mechanical parts are imported, thus the machine is high efficiency and strong reliability. The cutter moving in axial or radial direction is controlled by ball screws which are driven by three spindle servo motor. Turning times(4 times total) and cutter feeding value(≥1um) could be set up on touch screen according to user’s requirement. Three spindle servo motor controlling ensures the stable and precise cutter feeding. Servo motor drives the belt rotating, meanwhile, the friction of flat belt and rotor surface make the rotor shaft high speed rotating on V block. Equipped with lubrication device and aluminum alloy frame, this machine features advance technology and modern shape, has easy operation system and self-checking system. Meanwhile, this machine can be equipped with an automatic feeding device to achieve a fully automatic operation. This Double Cutter Commutator Turning machine is suitable for commutator turning, it’s widely used in the motor field, such as wiper motor, vacuum cleaner motor, mixer motor, window lifter motor, condenser motor, power tool motor, DC motor, etc. Equipped with lubrication device and aluminum alloy frame, this commutator turning machine features advance technology and modern shape, has easy operation system and self-checking system. Meanwhile, this commutator turning machine can be equipped with an automatic feeding device to achieve a fully automatic operation. PLC and touch screen control. 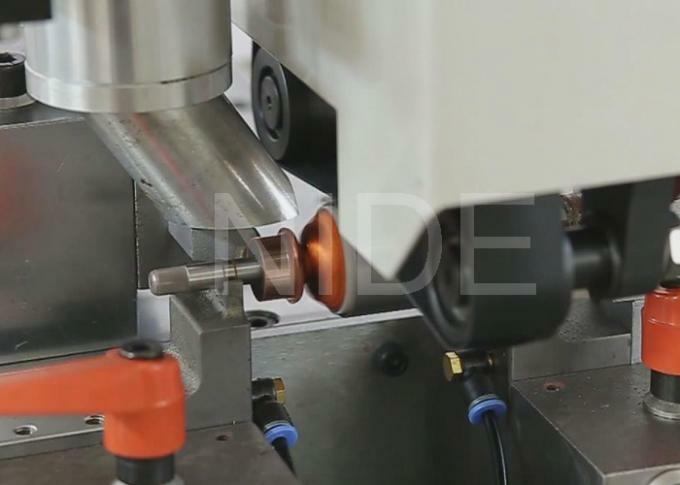 Cutter feeding and cutting is controlled by servo motor efficiently .